Persephone is a new dance party by OMOH co-founder Alexandr and seasoned disc jockey Klayman, showcasing a diverse musical style ranging from underground house, classic disco to groovy techno, focusing on female, queer, trans folks, people of color, underrepresented communities and their allies. Lakuti is originally from South Africa, spent 3 years in Toronto and more than 10 in London - now living in Berlin. Affected by soul, funk and jazz from a very young age, she later fell in love with house music and found herself involved in several music projects. While in London, she programmed Friday nights once in a month in Plastic People, ran the Süd parties (for 11 years! 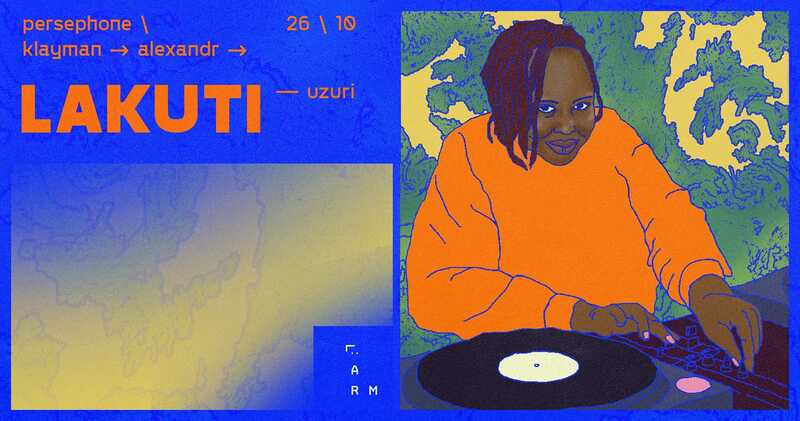 ), and founded two labels: Süd Electronic (with Portable aka Bodycode) and UZURI Recordings & Bookings. Nowadays she is responsible for Your Love in London and Finest Friday in Berlin's Panorama Bar, both co-programmed by Tama Sumo, with whom they have recently started a new project called Bring Down The Walls. As a DJ, her bag contains records from a wide spectrum of techno music music along with afro house, disco and funk elements.